Big Sky Rail provides producers with a competitive freight alternative and ensures that the railroad stays active and available for Saskatchewan's vast delivery needs. 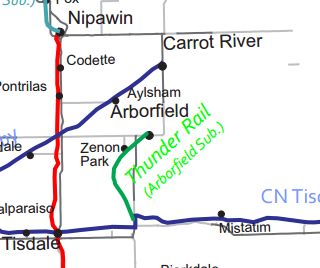 CN running rights from Davidson northwest to Saskatoon, and Saskatoon southwest to Delisle, connect BGS with it's affiliated and preceding shortline, Last Mountain Railway. At Great Sandhills Railway, we aim to provide quality and exceptional service to each and every customer. We work hard every day to be innovative, effective, and to meet the needs of our customers. We value the safety of each employee and everyone involved in the services we offer. The Great Sandhills Railway (GSR) is a Canadian short-line railway company with its head office located in Leader, Saskatchewan established in 2009. Great Sandhills Railway operates a short-line railway in Saskatchewan on a former Canadian Pacific subdivision. 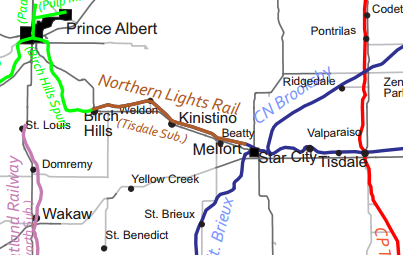 The railway serves freight stations in Burstall, Mendham, Leader, Prelate, Sceptre, Porteeve, Lancer, Abbey, Cabri, Battrum, Pennant, Success, Cantuar, and Swift Current. It interlines with the Canadian Pacific Railway in Swift Current and consists of 198 kilometers of track. GWR has been committed to supporting local communities and farmers and strives to maintain competitive rates for facilitating a thriving economy in the southwest. Last Mountain Railway is 136 kilometers of rail running from northern Regina up to Davidson, Saskatchewan. At LCR, community is important to us. We are a locally owned and operated short line, providing customers with loading sites along our 41 miles of track. Our main purpose is to provide producers an alternative that was once not possible. They now have the ability to find their own markets, and to load or have custom loaded their own grain, oilseeds, and pulses. Long Creek Rail was established in 2012. It has 41 miles of former Canadian Pacific Railway track. The line begins at Estevan and continues west to Outram, Torquay, Bromhead, and ending at Tribune. The Red Coat Road & Rail has been in operation for 12 years and were one of the first short line railways in Saskatchewan. 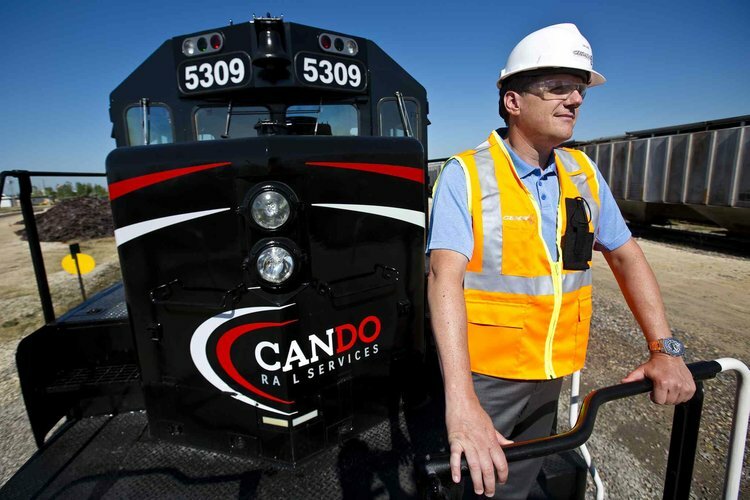 They were able to purchase the rail line Canadian Pacific Railway (CPR) by selling shares. Seven elevators were saved along the rail line, offering producer spots along the line. The historical operator of Red Coat Road & Rail was Southern Railway and their current operator is Great Western Railway. During the Southern Railway era, commodities were moved by a Brant truck. Alberta Prairie offers an exciting one day adventure on board a real steam or diesel-powered train. Different themes are enacted throughout the season, including murder mysteries, family, live stage show, seniors and teddy bear specials. 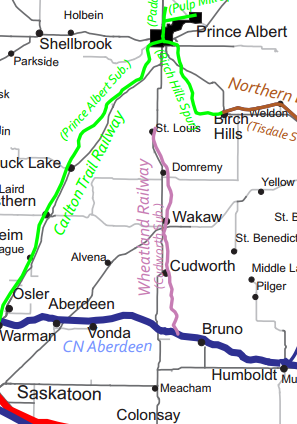 The BRR is a community owned rail line located in central Alberta, Canada. Our intent is to prevent further loss of transportation and agricultural infrastructure. The BRR operates as a user-friendly short-line where producers and other interested parties are able to consider both originating and terminating freight on the line. 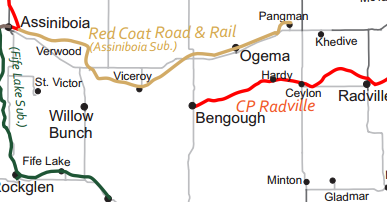 The Central Manitoba Railway (CEMR), which is owned and operated by Cando, is a 67-mile short line running from East Selkirk north of Winnipeg to Carman south of Winnipeg and serving 20+ transportation customers. The short line, which was established by Cando in 1999 with the acquisition of CN’s Pine Falls and Carman subdivisions, services a variety of industrial customers with the main commodities being grain, fertilizers, paper, fuel, steel products and chemicals. CEMR interchanges daily in Winnipeg with CN in Symington Yard and CPR at Transcona Yard. The Western Canadian Short Line Railway Association, previously the Saskatchewan Short Line Railway Association, is a not-for-profit membership based organization representing the interest of 17 short line railways across Western Canada..